Email marketing is one of the more successful channels for communicating with consumers. With over 91% of consumers using email at least once a day, and with an average return of $44.25 for every $1 spent on email marketing, it makes sense to target consumers through their digital inbox. But its not enough to just send an email blast out to a targeted list. With over 51% of email opens occurring on a mobile device, it is important to develop mobile optimized emails. Recently, Jacobs & Clevenger was tasked with improving one of our more successful mobile optimized email templates known as “Service Date.” You may be thinking, “If it’s already a successful template, why mess with it?” As direct marketers, our goal is to employ different techniques to improve upon the communications we send to our target audience. Below are 6 techniques we used to enhance our “Service Date” mobile optimized email template. When designing for a mobile optimized email it is important to think responsive design first. Responsive design allows the layout of your email to be flexible and scalable, so that it can adapt to different screen sizes across devices. While our previous “Service Date” email was responsive, it’s layout was based on a 2-column format. In order to improve upon the layout the design was changed from a 2-column to a 1-column format. The 1-column format was selected to offer a more consistent experience between desktop and mobile devices. This layout also allows the design to restructure the hierarchy of information to fit with how most online content is read, which is from top to bottom. Changing the layout also provided a fresh look for audience members who had seen the previous template. Whether viewing an email on a desktop or mobile device, the subject line and preheader are the first elements your audience sees in their preview pane. It is important that these elements work together to give the viewer a quick overview and entice them to open the email. While this might seem like one of the more obvious email techniques, often times it goes overlooked. For example, if the “View as…” copy is placed above the preheader, it will display in the preview pane first, disrupting the subject line/preheader flow. Another example would be omitting a preheader altogether, and having an image as the first element in the content of the email. The alt tag for the image will appear after the subject line in the preview pane, which can cause a disconnect in messaging. In order to enhance the “Service Date” email template, the subject line and preheader were written in a supporting manner to provide a sense of legitimacy and urgency. Personalization is a key tactic for enhancing mobile optimized emails. According to a study by the Aberdeen Group, personalized emails improve click-through rates by an average of 14% and coversion rates by 10%. Personalization tells your audience that you have a prior relationship with them. It also allows your email communication to stand out from the myriad of emails floating in a person’s inbox. 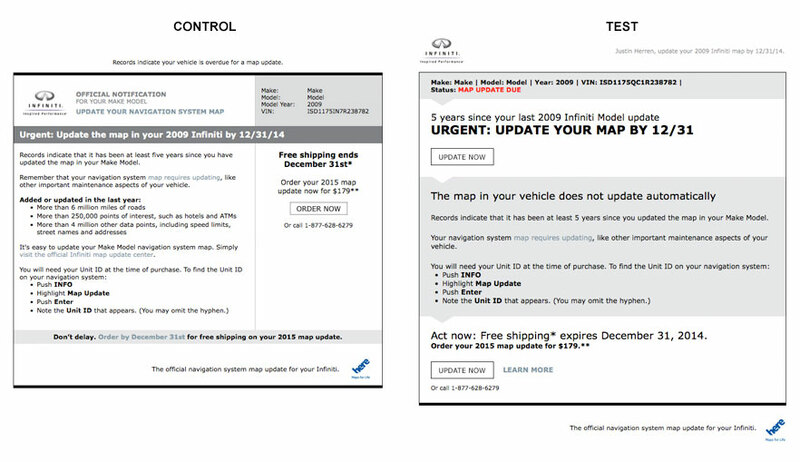 For the “Service Date” email revamp, personalization played a key role in shaping the content. Utilizing the data we had on our audience, we were able to customize multiple fields including such as name, vehicle make, vehicle model, model year and VIN in the subject line, preheader and body copy. Relevant content is key for any communication channel. However, sometimes there is a tendency to cram as much content as possible into an email communication. Instead of relying on the email to do all the heavy lifting for a campaign, streamline content to focus on the key objective of the email. Whether it’s getting your audience to click through to a landing page or to call a phone number, craft your content so that it is clear to the audience what you want them to do. In the revised “Service Date” creative, content was streamlined to focus on the offer and the timeliness of needed action from the audience. This allowed the email to play it’s intended role in the campaign, which was to drive viewers to the landing page to purchase and learn more about the product. This also plays to the strengths of mobile optimized emails by having less content for the user to scroll through before taking action. At times it can be tricky to get your audience to commit to a course of action. You want to be direct with the action you want them to take, but some viewers may not be ready to take that step. Offering up a hard and soft commitment option can help ease users into taking the action. The main goal of the “Service Date” email is to drive users to a product landing page to purchase. In order to enhance click-through response we incorporated an “Update now” button along with a “Learn more” text link. Both call-to-actions took the user to the product landing page. This allowed the audience a choice of the level of commitment they were willing to engage with. As you can see even if a mobile optimized email is performing well, it pays to continually find ways to enhance upon your success.